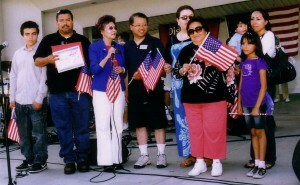 New United States citizens Hiu Bun Chan, Ying Hsiung Chen, Soledad McCrady, Lifen Cui, Khin Myo Swe, Ying Wang, Yu Yang, Tingnu Zhong and Bilan Cau were honored during Monterey Park’s celebration held at Barnes Park Amphitheatre. Dr. Sophie Wong and Jane Tak Gee joined Mayor Betty Tom Chu, Councilmember Mitch Ing and City Clerk Dave Barron at the celebration. 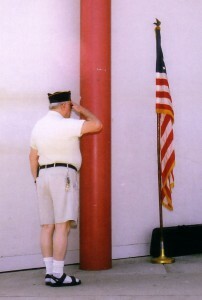 Members of the American Legion Post 397 presented the colors and led the Pledge of Allegiance. 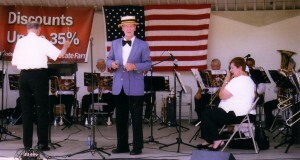 Leonard Burns and the Monterey Park Concert Band entertained the crowds with patriotic music and show tunes. Mayor Chu said Happy Birthday America! 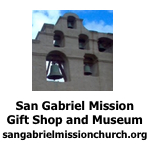 We are so proud to be here in the city of Monterey Park. This is the birthday of the Declaration of Independence. 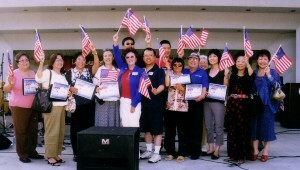 We are able to celebrate the naturalized Americans. People come from South America, North America, Central America and the Far East. She welcomed everyone to our celebration. Enjoy! Remember the freedoms of the Declaration of Independence and the U S Constitution. This is a holiday but don’t forget the men and women fighting for our right to speak, to write and to pray. Some people are trying to remove “Under God” from the Pledge of Allegiance. They don’t have to say it but they don’t have the right to take it away. We have the right to say “Under God”. Councilmember Ing welcomed all to Monterey Park Barnes Park. 4th of July means more that the Coney Island Hot Dog Eating Contest. He read the famous poem from the base of the Statue of Liberty. Let us always be a beacon of hope. Happy 4th of July! City Clerk Dave Barron said Happy 4th of July! Have a great time. Take care of your family. This is a great celebration. Enjoy the fireworks show! Members of the Garcia family were honored for their military service. 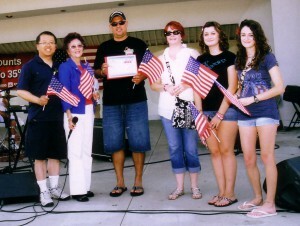 Richard Santiseban and his family were honored for their military service. Children enjoyed the Straw Toss contest. The winners were Denise, Shawn and Ivy. They also enjoyed a wonderful game of Simon Says. Breanna was the winner. 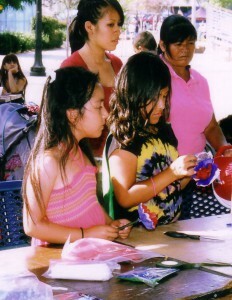 The crafts table supplied red, white and blue crepe paper so the children could create flowers. Some children opted to have their faces painted with a flag, stars, kitty cats, Batman or butterflies. 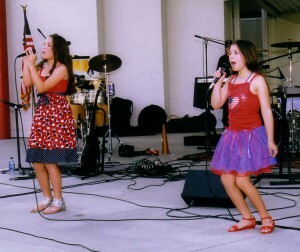 Mea Heatly and her sister Bobe Heatly entertained the crowd with several popular songs. 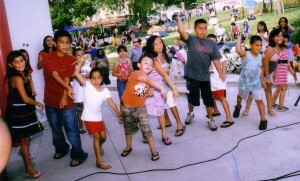 Children were invited up on the stage to dance to Rocking Robin. Members of the Rudy Macias Band entertained the spectators with classic rock and roll favorites. The event also featured several food booths and an information booth by State Farm Insurance one of the sponsors. The Golden Stars Sky Divers had a demonstration that thrilled the crowd. At dusk the fireworks shows began as the sky over Monterey Park, Alhambra, Rosemead and Pasadena were filled with spectacular bursts of color. It was a wonderful celebration!